As suggested by Zvezda here is the Type-1 single button Chrono I am waiting to arrive from Tashkent. The movement date does needs verifying. The case is marked ABB. In the other post I asked about the ABB 'Artel'. I understand that the period just before the Great Patriotic War was a turbulent time for co-operatives and asked if any members know when it was disbanded. hampden ha scritto: In the other post I asked about the ABB 'Artel'. I understand that the period just before the Great Patriotic War was a turbulent time for co-operatives and asked if any members know when it was disbanded. Unfortunately, there is no document I know of which states how long did ABB survive before getting disbanded. However, modified watches bearing the ABB mark do exist which are based on movements as late as 1941. See for instance #1268 in Mark Gordon's collection, which is based on a 3Q-1940 movement. 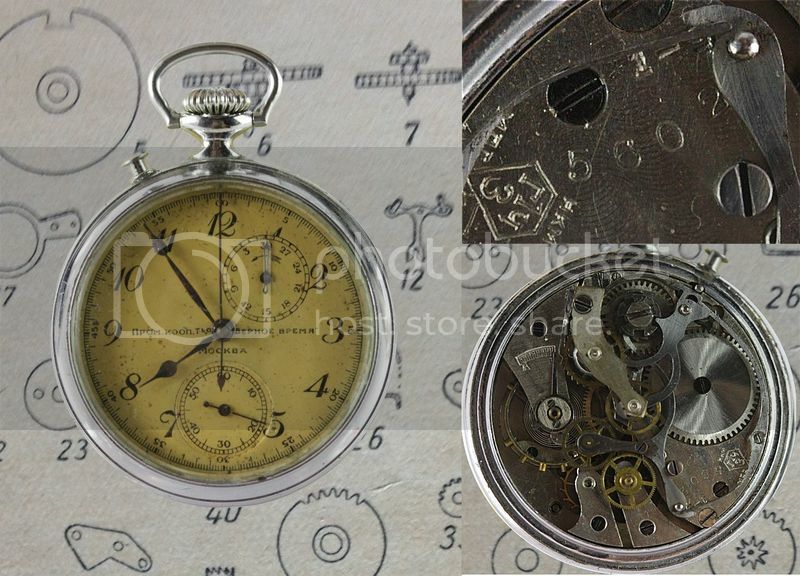 Another one is the following pocket watch with center seconds, which was for sale at meshok.ru a while ago. The ABB logo is barely visible in the last picture, right under the serial number. The movement is dated 3Q-1941. Interestingly, both samples show a well preserved movement, but an oxidated additional brass piece. An obvious sign of the much better quality of the plating applied at the factory. The Артель Верное Время, Artel "Right Time" was not alone in making modified Type-1 watches. At least another artel was operating in Moscow in the same period. It's the ТМП, short for Трест Местной Промышленности, Trust of local industry. There are several Type-17 wristwatches with the TMP logo, like #0469 (1Q-1941) and #1445 (4Q-1940) in Mark Gordon's collection. Earlier TMP watches were stamped ТМП Сок. Района, Москва (Района «Сокольники», Sokolniki District) maybe because that was the former location of the TMP artel in Moscow. The following TMP pocket chronograph was - and perhaps still is - for sale on meshok.ru too. Among the few subtle differences, note the inspection hole on the additional brass bridge, a feature not present in the ABB version. Particularly interesting is Mark Gordon's #0013 (1Q-1940). It is a TMP pocket chronograph with serial number very close to yours, also featuring the inspection hole on the additional bridge. A similar watch to the last one you pictured is also on eBay http://www.ebay.co.uk/itm/Extra-Rare-US ... SwL7VWr9cb. It is less money than the one I purchased, however it was not in working order. I did note the ТМП dial logo - it has a 1SWF movement stamp. The stamp on the one you pictured seems to have been ground down. Here is a link to a video of the watch being used. The clicks are very sharp and precise. The watch is more tactile than a standard Type-1. Thank you for the video, the watch is stunning and, indeed, the action looks remarkably good. No question that people at ABB knew what they were doing!